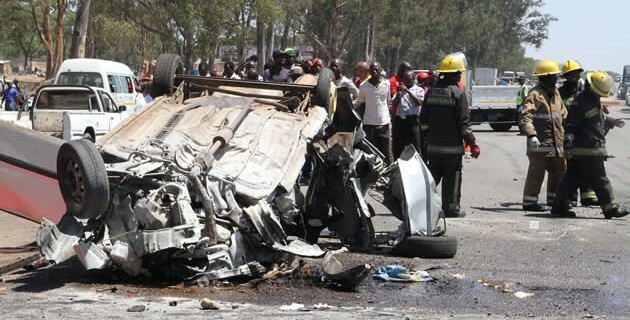 FIVE suspected armed robbers who were killed when their Toyota Raum collided with a bus near Zindoga Shopping Centre along Simon Mazorodze Road in Harare had allegedly robbed a Nigerian of US$30 000 in the city. Borris Mushonga (35), Bright Mupamhanga (29) ofHighfield, Terrence Tuware (19) of Mbare, Shyleen Mukoma (16) of Mufakose and Alois Kangwara (19) of Mbare, died on the spot when their getaway vehicle was involved in an accident. Police said the five were on their wanted list on allegations of robbing passengers using their getaway vehicle and commuter omnibuses, during the night. They targeted cash, cellphones and laptops, among other valuables. On October 17, the gang had allegedly robbed several people in and around the city after offering them a ride. Sources yesterday said among the victims was a Nigerian. After robbing him, Mushonga — believed to have been the ringleader — hid about US$10 000 at his home in Mbare. It is believed that when the gang was involved in the accident, Mushonga had US$17 000 cash in his pockets. It is not clear where the other US$3 000 went. The money was reportedly taken by some of his accomplices who arrived at the scene of the accident before the police. Last week, National police spokesperson Chief Superintendent Paul Nyathi confirmed that there was an unidentified car which arrived at the scene of the accident. He said the occupants reportedly searched the bodies of the robbers and the wreckage before driving off. Chief Supt Nyathi said they believed that the suspects could have taken away weapons, including a gun that was used to commit crimes. 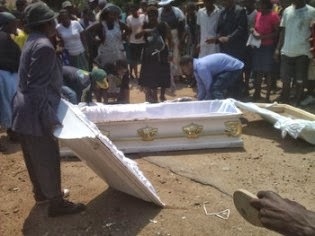 Police last week arrested eight suspected armed robbers at Mushonga’s funeral procession. On the fateful day, the gang offered a lift to a woman in Avondale before robbing her of her cellphone. According to reports, a motorist who was following behind saw the fracas and gave chase. The Toyota Raum sped off and went through a roadblock. It nearly ran over a policeman manning the roadblock. The motorist who was giving chase picked a policeman at the roadblock and pursued the suspects. It is reported that the chase ended in Mbare where they lost sight of the Toyota Raum. An hour later, the gang perished in an accident. The Toyota Raum, was heading towards Mbudzi roundabout, while the bus belonging to G Muzanga Transport was driving into town from Nerupiri in Gutu, Masvingo, when the accident occurred. The other eight suspects were this week denied bail and are expected back in court on November 6. Harare magistrate Mr Elijah Makomo considered that the eight were facing a serious offence which attracts a lengthy custodial sentence if convicted. Lazarus Jimu (23), Tatenda Tanhira (23), Maxwell Mushonga (22) and Chamunorwa Machingauta (27) appeared before Harare magistrate Mr Elijah Makomo facing robbery charges. The other quartet of Rodwell Keith Undi (33), Rodney Akende (37), Bernard Kaitano (31) and Mugove Chikukwa (25) separately appeared before the same court facing robbery charges and were remanded in custody to November 6. The two groups were not jointly charged.